Dhanteras is celebrated on the thirteenth day (teras) of the Krishna paksha (the waning cycle) of the lunar month of Ashwin in the Hindu calendar. It heralds the beginning of the five days of Diwali, the biggest festival for Hindus in India and all over the world. Dhanteras falls on October 26th, 2008. Dhanteras also has great importance for the trading and business communities in India. Homes and businesses undergo a tremendous transformation via extensive cleaning, renovations and decorations. Traditional artwork of rangoli designs are made to welcome the Lakshmi – Goddess of wealth and prosperity. Lakshmi puja is performed in the evenings and naivedya – a collection of traditional sweets – is offered as prasad to the Goddess. 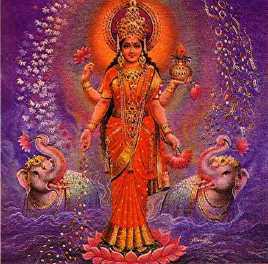 Dhanteras also honors the hindu patron of medicine – Dhanavantri. It is hence also referred to as Dhana-triyadoshi (thirteenth night). The legend of Dhanavantri is that he arose from the ocean during samudra-manthan (the churning of the oceans) by the Gods carrying a metal container with all the herbs and medicines needed to cure humanity of all diseases. One variation of the legend says that Dhanavantri brought ambrosia or the elixir of eternal youth for the Gods from the ocean. The emergence of Dhanavantri was preceded by the appearance of Goddess Lakshmi seated on a lotus from the ocean of milk. The first day of Diwali is also celebrated in some parts of India as yama-triyadoshi or yama-deep-daan. In ancient times, King Hima’s son was destined to die on the fourth day after his wedding. However, his wife came up with an ingenious plan – she decided that she was going to distract the Lord of Death – Yama – by lighting earthen lamps (deep) all around the palace and by displaying all the palace jewels around her husbands’ sleeping area. She also decided that she was going to keep her husband awake by singing songs to him and playing card games. When Lord Yama arrived, he was so impressed by her dedication to her husband that he decided to spare his life. The tradition arising from this legend is that Dhanteras is marked by purchases of gold jewelry and silver coins inscribed with images of Goddess Lakshmi and Lord Ganesha. Women in the household will also by new metal utensils for their kitchens. An earthen lamp is lit after sunset and is constantly refilled with oil to keep it lit throughout the night as an offering (daan) to propitiate Lord Yama. So how do you celebrate Dhanteras? Please share with us in the comments section below. awesome..very beneficial for agnostics or unbeliever of God.